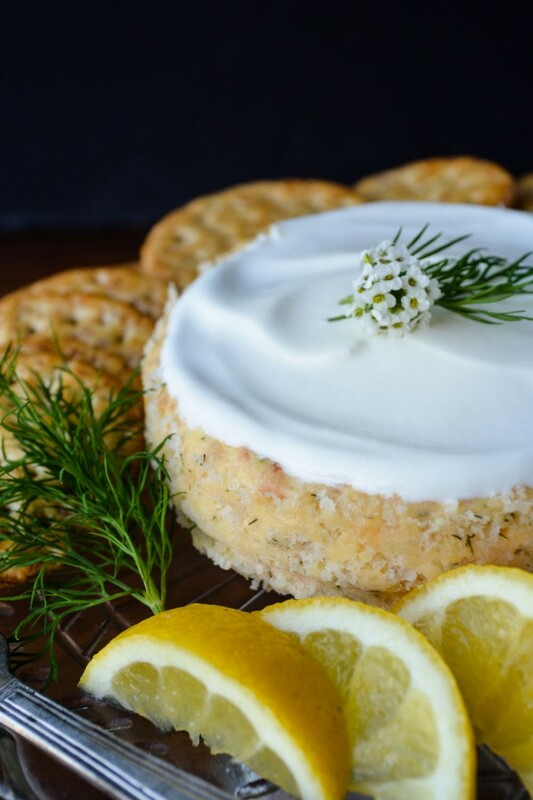 This Savory Smoked Salmon ‘Cheesecake’ is a unique and delicious appetizer for any occasion, it’s guaranteed to be the hit of the party! *This post is sponsored by Morey’s Seafood ~ thank you for supporting me and the brands I work with ~ I promise to bring you only the very best! Heads up everybody, this smoked salmon ‘cheesecake’ is a-mazing. 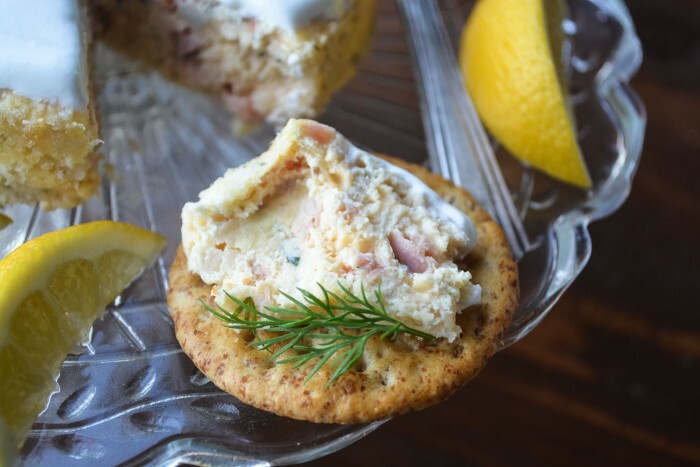 I think it’s got everything you could ever want in an appetizer – great looks, personality, a wonderful smoky flavor, and you can spread it on a cracker! What’s more, it travels well, freezes well, and wows everybody who tastes it. Try it once and I bet it’ll become ‘the thing you bring’ to every party going forward. You’ll be famous for it, mark my words. Go ahead, claim it as your own, no one needs to know you found it here, I won’t tell. I adapted it from Cynthia, at What A Girl Eats, who’s made it every Christmas for years. 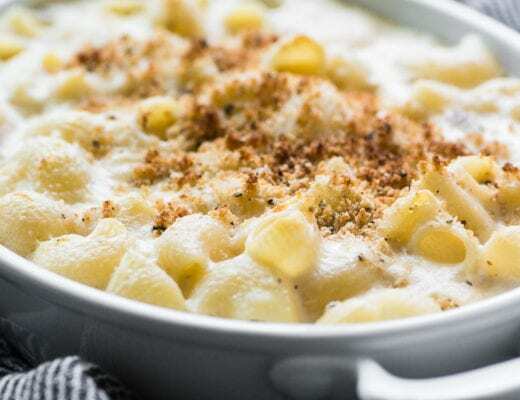 It’s that kind of recipe, once you try it, you’ll want to make it your signature dish. This is perfect for any occasion, but since Valentine’s Day is just around the corner, that’s what I was thinking about. I made it in two small sized cheesecake pans, each 4 1/2 inches in diameter. I figure you can eat the first one and freeze the second for a later rendezvous. The recipe is easy to put together, and the concept is fun. 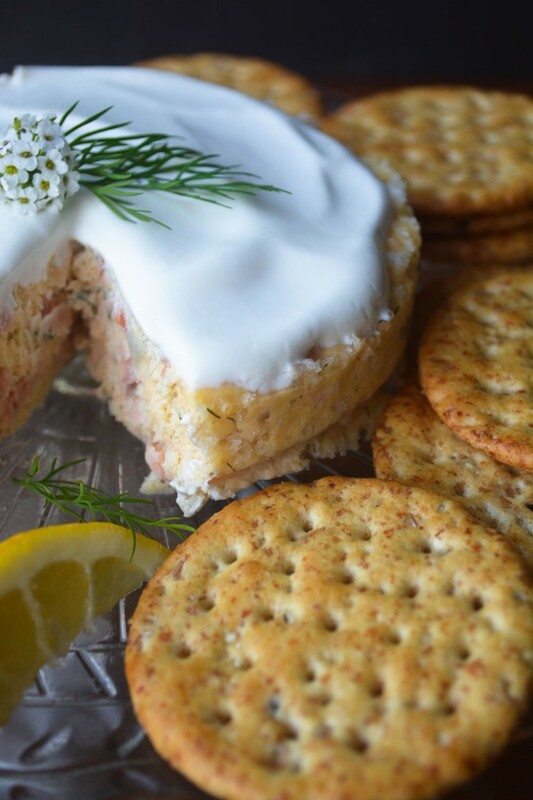 The name alone….savory smoked salmon cheesecake…lets you know this is seriously sensuous stuff. 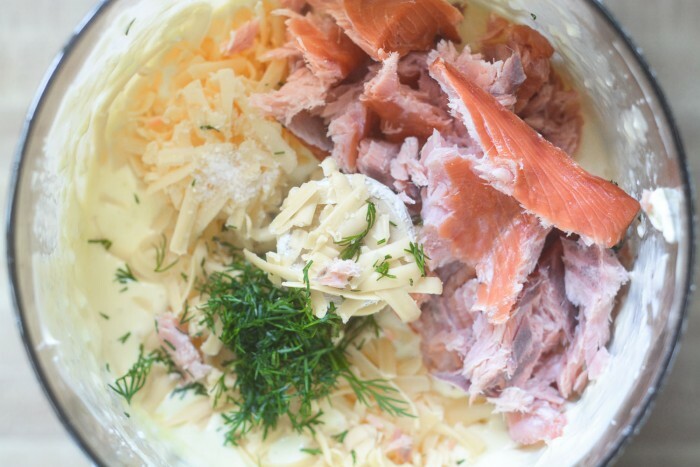 The ingredients really speak for themselves…smoked salmon, smoked Gouda cheese, shallots, cream cheese, lemon and dill are the main players. A couple of eggs bind it all together. It’s simple straightforward comfort food, packaged as a fancy appetizer…brilliant. 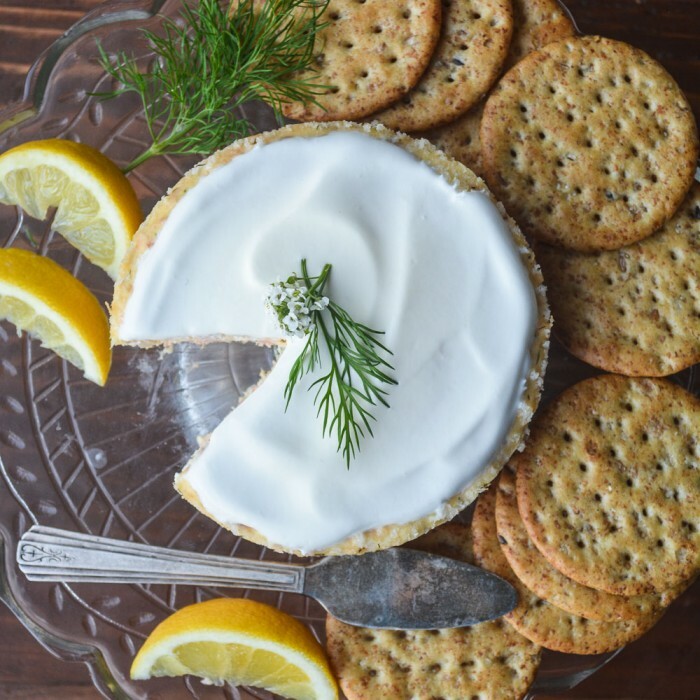 I used Wild Smoked Keta Salmon from Morey’s Fine Fish and Seafood, which is naturally hickory smoked, and the flavor is just perfect for this cheesecake. 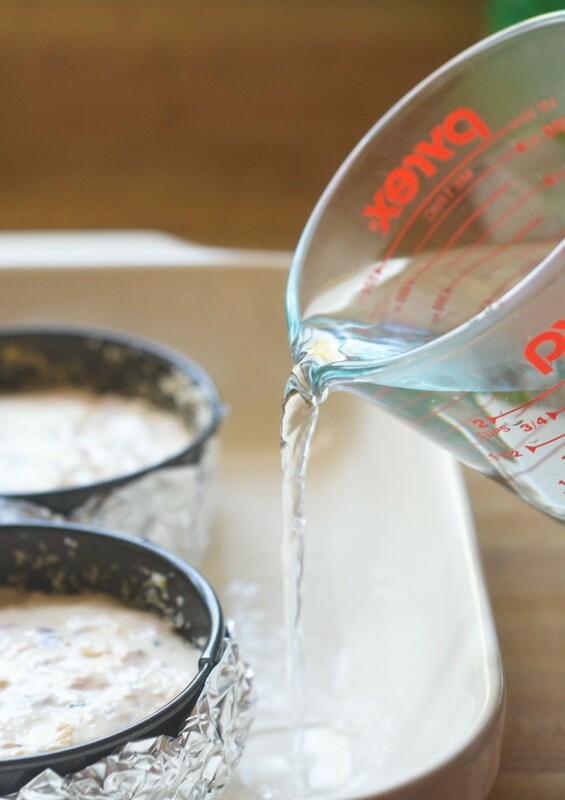 The fish has a firm texture, too, which is important, because you want the finished cheesecake to have obvious bits of that glorious pink salmon throughout. 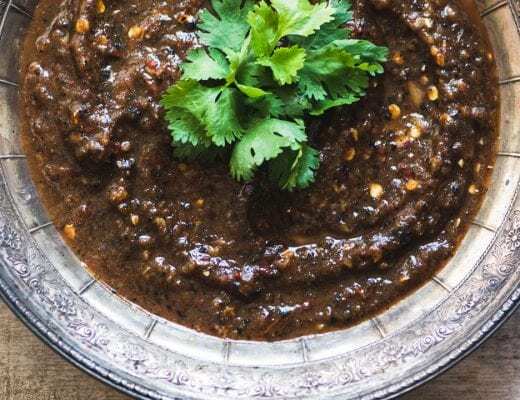 Just pulse it lightly in a food processor for the right texture. The smokey flavor of the salmon is enhanced by the smoked Gouda cheese, and the whole experience is lovely. The cheesecakes bake gently in a low oven, and a water bath helps everything cook evenly, just like you would do with a dessert cheesecake. I cooked them until there was no more jiggling and the center felt firm to the touch, about 50 minutes. I blended sour cream and lemon juice for the topping which gives it a nice zing. You can decorate the cake any way you like, but I think it lends itself to sprigs of dill and tiny blossoms from the yard. Cut the ‘cake’ into small wedges and spread on good crackers. 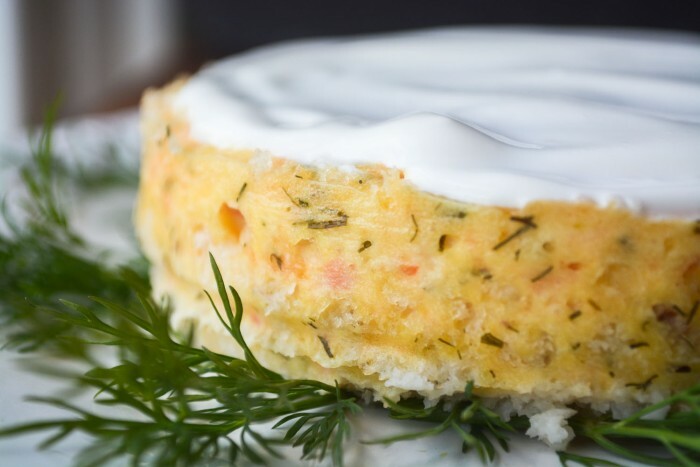 It has a soft pate, or mousse-like consistency, and there are nice chunks of salmon and little bits of shallot and dill throughout. Be sure to serve little slices of lemon along with it so everybody can squeeze a bit of juice onto each bite. I’m getting hungry just thinking about it! Morey’s has been fishing sustainably and environmentally responsibly since 1937, and that’s important to me since we all have choices when it comes to what we buy and eat. Morey’s smoked and frozen fish comes in so handy when I don’t have the time to go out and buy fresh fish for dinner. I keep a couple of packages of smoked fish in the freezer for this cheesecake, but also for quick pasta and egg dishes. Grant likes to eat it plain, with cream cheese and crackers. You can find their products in national and regional grocery store chains. “Sue, this is a fantastic dish even though I had to use ordinary Gouda and farmed smoked salmon topped with my homemade sour cream! It is a very gentle appetizer which I served it yesterday on Christmas Day with a glass of bubbly. I will do it again, this time as you suggested with trout and serve a wedge as an entree with a delicate leafy salad and a lemony dressing. 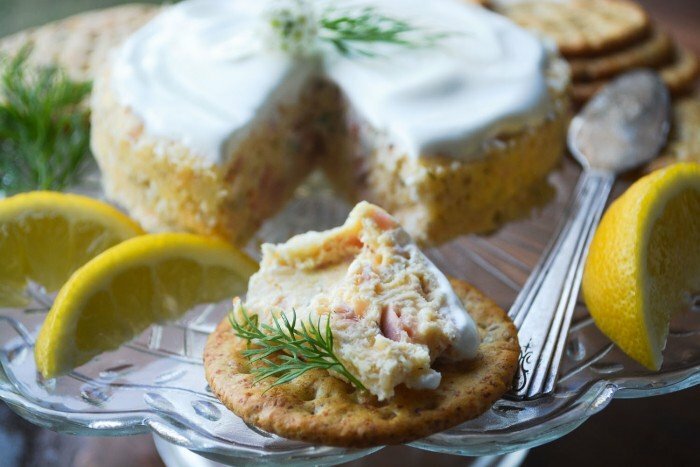 Thanks for pinning this Savory Smoked Salmon ‘Cheesecake’! This looks delish! Can it be made a day ahead of serving? Sure, I think it will hold up just fine. This complete genius, I love it and wil be making it soon. Looks and sounds like a wonderful treat. Looking forward to your new, inspiring ideas for next year, Happy Holidays, dear Sue! Sue, this is a fantastic dish even though I had to use ordinary Gouda and farmed smoked salmon topped with my homemade sour cream! It is a very gentle appetizer which I served it yesterday on Christmas Day with a glass of bubbly. I will do it again, this time as you suggested with trout and serve a wedge as an entre with a delicate leafy salad and a lemony dressing. 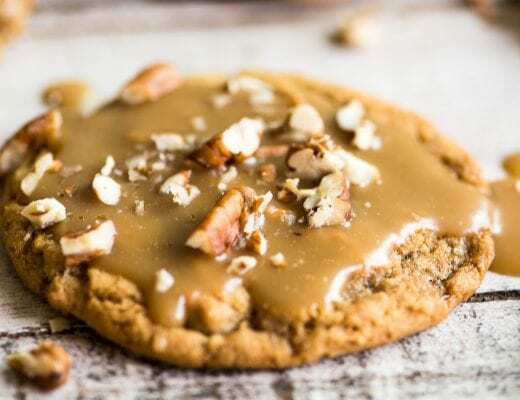 Thank you for this recipe, it is just so terribly incredibly right! Thanks so much for your comment Alexandra. I think I’ll try the trout this winter, too, and I love the idea of making a dinner out of it it! if I do not have 2 small 4.5″ pans and use my regular 9″ how much more cooking time should I add? I will be making this for mother’s day brunch!!! I’m going to guess about an hour and 15 minutes, Lea, but check it as it bakes and see. It should not be wobbly in the center. I made this a month ago and brought one to a get-together and froze one. It was amazing fresh and everyone raved. This past weekend I defrosted the other one overnight in the fridge and served it the next day, but the texture wasn’t quite the same. It seemed to have dried out a little and gotten crumbly, even though i wrapped it well in plastic wrap and then tightly in foil. Any tips on ways to keep this from happening? All I can say is to make sure you use a good heavy freezer grade plastic, and wrap it well, but that being said, nothing is ever as good after it’s been frozen. Made this for wine/cheese party last eve, and the night before! RAVE reviews- and requests to share! Hope it nets a few more readers for you- who will never be sorry!! thanks for helping me ‘re stock’ my freezer with the ‘right’ choice! I’m thrilled to hear that, but I’m not surprised, it’s that kind of recipe! This looks and sounds fabulous! I can’t wait to make it! What a beautiful presentation this would make for a party! You’re decorative touches are lovely. love these photos and the styling!! :) i would love to try this salmon cheesecake. Wow, that looks absolutely amazing. I am drooling on the computer! I think I could make this! I know you can! There’s nothing complicated about this at all, Jen. oh my goodness!! these pictures!! yum! I have never heard of combining the two but they are two of my favorite things! We eat a crazy amount of salmon on our house and this is such a beautiful and clever way to serve it! We do too, Andi – and I love smoked fish because you can keep it around longer. Do you think, instead of freezing the fish ahead of time, you could make up the entire thing and freeze that? I think you could do that, but leave off the top layer and garnish until serving, Melanie. Okay my husband is like the King of Cheesecakes around here, but he never makes savory ones. I love smoked salmon, so I’m definitely going to give him this recipe!! This is such a great appetizer for a party! Or a great entree for a brunch! I love savory cheesecakes and used to make them fairly often. I actually prefer them over sweet ones. Thanks Sue! This is a genius recipe. I am so happy to have it! I have the small spring form mold and have made a ricotta and red pepper cheesecake. I know my hubs will love the smoked salmon version. Thanks Sue! You know ricotta sounds like a nice substitution, I love ricotta dessert cheesecakes! 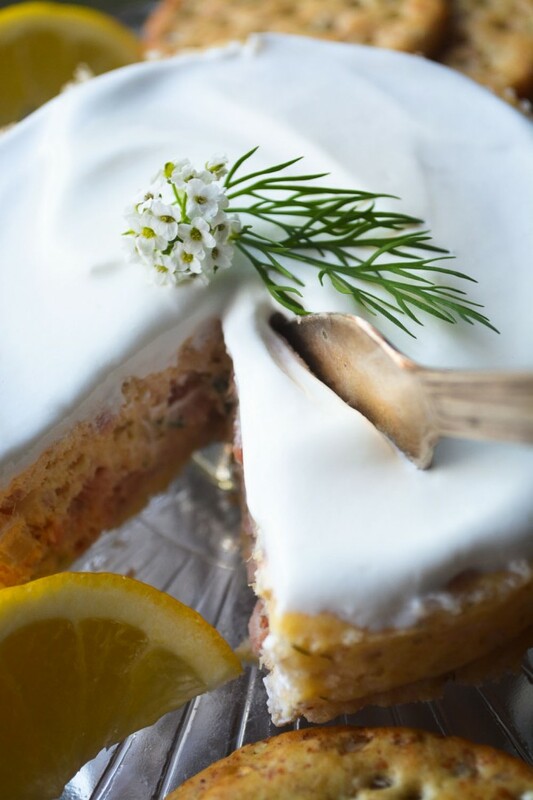 I just discovered your blog and wanted to stop by to say this salmon cheesecake looks wonderful. It is such a beautiful, elegant, and delicious looking appetizer. I’m so glad you found me Thao, welcome, and thanks! What an inspired appetizer idea, and the presentation is so perfect for entertaining! Love your photos. Good to learn about Morey’s also- will check them out- thanks for the intro! Looks amazing indeed! My beloved doesn’t care for cheesecakes, but I bet a savory type with smoked salmon will wow him! perfect for V-day too…. I have no idea what we will cook this year, but it will be a home-cooked meal, that’s for sure! Yum. I know Morey’s stuff well. Great firm texture and that hickory smoking’s done to perfection. Never would have thought of this, though. Sounds like heaven on a cracker. I appreciate your generous spirit, illustrated by urging us to “make it your own, after all you’re going to be famous for it”! There’s something refreshing about open-hearted sharing. I’ve enjoyed your blog and recipes for a couple of years, (your popscicles drew me in), and this post puts my fandom over the top! Thank you! Wow! That is gorgeous! It reminds me of some really lovely Scandinavian savory style cakes. I bet it tastes amazing.. I know, the smokey salmon and the smoked Gouda gives this a really nice smokey punch. So glad you liked it sue! Now you’re making me crave it again! Beautiful photos! What a great appetizer. So beautiful, too! Love the smoked salmon/smoked Gouda combination. I have a thing for smokey flavors, so I love to use smoked cheese whenever I can…thanks Jennifer! This cheesecake is not only stunning, but sounds so delicious! What a great starter for a dinner party, or even at a cocktail party! I have to put this on my list of appetizers for my next get together. I’ve never heard of Morey’s, so thanks for the introduction. I think I have been searching for this recipe forever. Can’t wait to try. Wow – this is what I want when I come to see you one day! I could seriously hurt myself on this cake. The presentation is gorgeous! Tricia this is seriously great, we do have to get together over one!